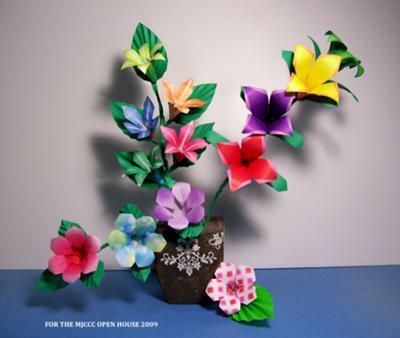 The flowers on the lower stem, and the one sitting next to the vase, I found in a book titled Origami Flowers by Hiromi Hayashi. There are two variations of that flower, one on page 106 and the other on page 107. In the book, they are folded from a pentagon. You'll notice that the one sitting beside the vase is from a pentagon but the other three I did from a hexagon. I've also tried it from a square and, although it works, I'd say not as good. The ones on the centre stem start like the traditional lily, but when I continued them with the traditional folding method using a pentagon or a hexagon, the petals were very short. So I figured out a way to make them longer. They turned out to my liking. The top one on the middle stem is from a hexagon. The other four on that stem are from pentagons. Click the small photos to enlarge. Other examples of the flowers with the different coloured edges. Editor's note: Carambola is another name for the starfruit. When you slice a starfruit crosswise, the slices have the shape of a five-pointed star, hence its name. 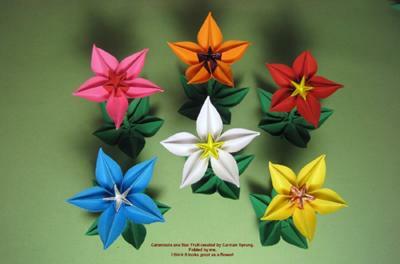 You can find flowers similar to this in the book Bob mentioned earlier, Origami Flowers by Hiromi Hayashi. My mother-in-law's birthday is on Valentine's Day. I folded her this bouquet. Took about 15 hours. They are folded from card stock of varying kinds. 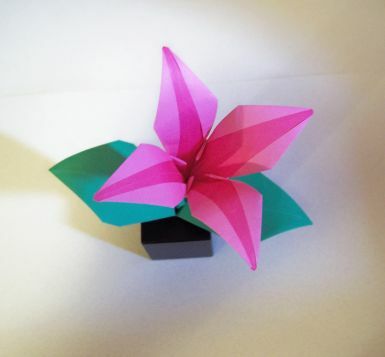 The purple part is a flower found in the book Origami Bonsai. 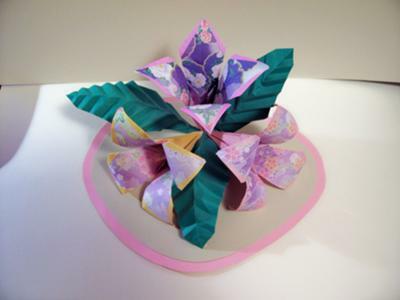 The second layer is a variation of a simple lotus with the outer row of petals folded differently. Sort of looks like a rose. I don't remember where it's from or if I worked it out myself. I've been folding it for more than 20 years. 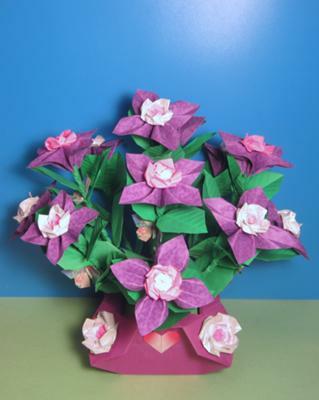 I've "Googled" origami roses and can't find a version exactly like that. The middle or third layer is something I found in a video and once again can't find it. It's from a water bomb or balloon base and you fold the points to the middle and twist or swivel and push down in the palm of your hand and there it is. 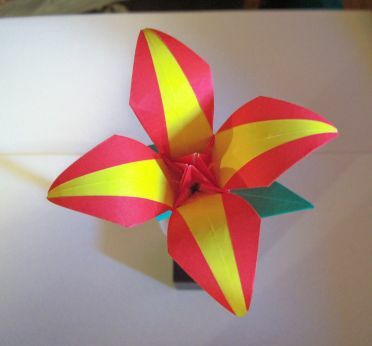 So the flower is actually made from 3 origami flowers. I'm sure she will like it. 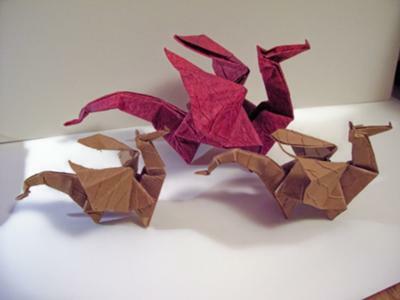 The one titled Baby Dragon I created in 1986. It's from a Fish Base. 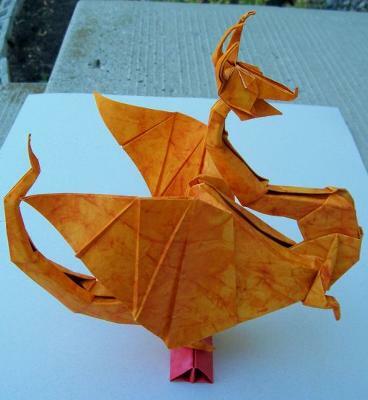 There is a drawing of it in The British Origami Magazine, October 1987, Number 126. 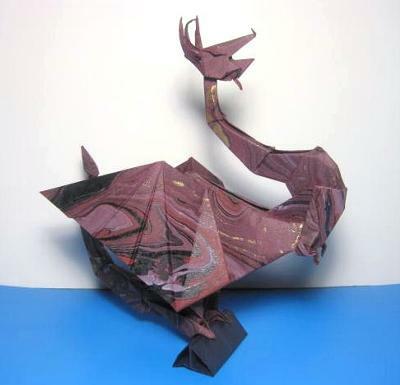 It's folded from a single sheet of art paper. There are very badly drawn diagrams. The other 2 pictures are of a dragon I created in 1993. It is from 2 pieces of uncut art paper. The body is from a Fish Base and the head is from a Bird or Crane Base.